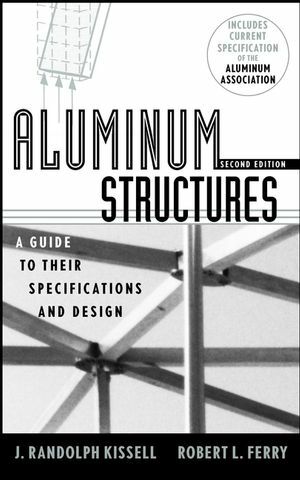 "The book is a success in providing a comprehensive introduction to the use of aluminum structures . . . contains lots of useful information." "A must for the aluminum engineer. The authors are to be commended for their painstaking work." PART II: STRUCTURAL BEHAVIOR OF ALUMINUM. Explanation of the Aluminum Specificaton. Orientation to the Aluminum Specificaton. PART III: DESIGN CHECKS FOR STRUCTURAL COMPONENTS. PART IV: DESIGN OF STRUCTURAL SYSTEMS. Structural Systems Built with Aluminum. PART V: LOAD AND RESISTANCE FACTOR DESIGN. Appendix A: Pre-1954 Wrought Alloy Designations. Appendix B: Section Properties of Common Aluminum Shapes. Appendix C: Minimum Mechanical Properties of Aluminum Alloys. Appendix D: Allowable Stresses for Elements of Common Aluminum Shapes. Appendix E: LRFD Design Stresses for Elements of Common Aluminum Shapes. Appendix F: Column Buckling Allowable Stresses. Appendix G: Summary of the Aluminum Specification Design Provisions for Columns and Beams. Cross Reference to the Aluminum Specification. Appendix I: LRFD Design Stresses for Various Alloys. Appendix J: Other Aluminum Structural Design Specifications.